~ CCS is a sleep-away performing arts-based camp for ages 7-17. ~ We're located in Livermore, Maine (1 hour north of Portland) and on the west shore of Maui. ~ Our Leadership Program is available for ages 16-18. ~ We feature a Community Enrichment program at our Maine campus. ~ Our campers come from all of the country, with many coming from New England and New York. ~ We have needs-based scholarships available. ~ Our leadership team has been running overnight camps for about 20 years. 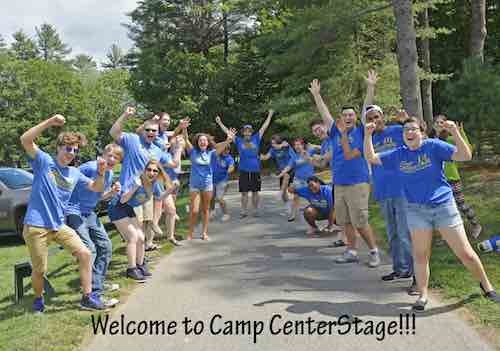 ~ Camp Centerstage (CCS) has been operating for about 10 years. ~ We have a Registered Nurse on site at all times. To create a judgement free environment where campers are encouraged to explore and share their talents, and provides a camp experience that combines the performing arts and traditional camp experiences as a way to teach positive life and leadership skills. We are committed to nurturing young artists of all experiences in a non-competitive and encouraging setting. CCS's invigorating theatre camp program offers campers the opportunity to learn valuable life skills through a variety of arts and traditional camp experiences including: acting, music, performance skills, dance, creative writing, film making, variety arts, water sports and more. The choice is yours - music, drama, dance, art, writing, film or technical theater; everyone shares in the excitement of working towards the final talent show which is completely created by the campers. lighthouseCamp CenterStage was started by a core group of experienced arts educators who have a shared vision of creating a top-notch camp experience. This vision includes 1) creating a safe and supportive environment where campers value the arts and each other; and 2) guiding the campers in using their talents to make the world a better place. We provide a safe environment which will nurture camper's talents and provide them with ways to use those talents for the betterment of themselves and their community. We also wanted to create the ability to steer own course. Because we are a stand-alone program, we are able to invest directly back into the program allowing us to create unique opportunities for our campers, and ensure continued growth. This same group also saw great potential in creating a symbiotic relationship with other camps. Camp CenterStage will work with our host, Camp Agawam, in building values and traditions, while also building our Community Service component by establishing relationships with neighboring camps and sharing the talents of our campers with them. To create a safe and supportive camp environment of inclusive youth artists who value serving each other and their communities through the use of their talents. To be an artistic and adventurous co-ed overnight resident camp that provides a safe, nurturing instructional experience to campers of all ages and experiences, and to have every camper leave camp wanting to be an active participant in their school, family and community. "Life skills through the arts". ​The Camp CenterStage experience is like nothing else. For us, returning to Maine for two weeks every August is a pure delight and a reward. Most people come to Maui (our residence) for a vacation, but we come to Maine. We return because of the incredible camp experience. This experience includes the people we work with, the campers we see grow and learn, the gorgeous surroundings of Camp Agawam and Crescent Lake, and the outstanding leadership and arts program provided by our peers. We are grateful to Lisa, Jeffrey, John, Susan, Kathy, Carla for sharing their passion with campers, counselors and CITs. We are equally thankful to those who have laid down the ground work for CCS: Anna, Brian, Shay, Jennifer and so many others! It is the time, commitment and energy from CCS counselors and staff that put the final dance steps to this beautiful musical we create summer after summer. Many people have asked us why we started Camp CenterStage - and the answer is simple: to provide a top notch arts and leadership training program via the best form possible: summer camp! CCS is not tied to any other organization, group or Board. The sole reason for CCS, LLC is to provide an outstanding camp experience to every camper, CIT, counselor and staff member. Thank you for taking the time to read about us, to send your child to camp or to become a staff member. Our Leadership Program provides campers ages 16-18 the wonderful opportunity to shadow our trained camp Counselors, learn more about being a Counselor, gain a new perspective on camp, and explore important leadership skills. Although campers enrolled in this program are still officially "campers", they have increased responsibilities, while also enjoying all the fun of being a camper! In addition CITs & LITs are eligible to enroll in CCS's MasterClasses as well as enjoy a discounted tuition. Camp CenterStage Counselors-In-Training (CIT's) are senior campers (16 and 17 years old) who are ready to explore what it takes to be an outstanding CCS counselor. The CCS CIT Program strives to train young men and women to become effective and talented camp counselors. CIT's play an extremely important role in leading and mentoring campers. Some of these responsibilities include: assisting Counselors with cabin projects, checking in with campers throughout the day, and participating in activities and talent shows. CIT's are also responsible for designing and running two of the camp's evening activities. The Camp CenterStage LIT Program is geared toward 2nd or 3rd year CIT's who are 17 or 18 years old. LITs take a leadership role at CCS, participating in a similar capacity to a full staff member; but they will have less responsibility supervising campers and more emphasis on leadershipt training. ​In keeping with our philosophy of "Achieving excellence through the arts", Camp CenterStage will provide campers an experience which will nurture their talents and provide them with ways to use those talents for the betterment of themselves and their community. To that end, CCS will provide community outreach opportunities by hosting a field trip to a nearby camp where CCS's campers will share their talents and skills with the community.